The 15.4-inch MacBook Pro with Touch Bar (Late 2016) was introduced by Apple on Oct. 27, 2016 during a media event at the company's Cupertino campus. Billed for its "Groundbreaking" design, this new family of MacBooks incorporates a breakthrough interface called the Touch Bar that replaces the traditional row of function keys on the MacBook's keyboard with a Retina-quality Multi-Touch display. The Power button on the Touch Bar also incorporates Apple's Touch ID authentication technology, which lets you quickly unlock your Mac, switch user accounts and make secure purchases with Apple Pay on the web with a single touch. Under the hood you'll find the latest sixth-generation quad-core Core i7 Intel processors, 16GB of 2133MHz LPDDR3 onboard memory, as well as more powerful Radeon Pro discrete graphics processors that are up to 2.3 times as those found in the previous generation, the the 15.4" MacBook Pro (Mid- 2015). At just 15.5 mm thin, the new 15.4-inch MacBook Pro with Touch Bar is also 14% thinner and 20% less volume than its predecessor. It's also nearly half a pound lighter at just four pounds. 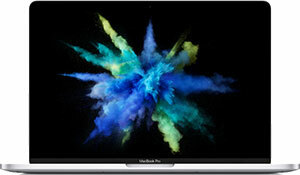 Available in both Silver and Space Gray, these MacBook Pros also feature a new keyboard with a second-generation butterfly mechanism; more vidid Retina displays that are 67 percent brighter and feature 67 percent more contrast than the previous generation; 46% larger Force Touch trackpads; and louder, more true-to-life sound through speakers with double the dynamic range and improved bass. Each 15.4-inch MacBook Pro with Touch Bar also comes pre-loaded with Apple's latest macOS Sierra operating system.